Robert Bingaman enjoys the effect of frozen water in his watercolor sketches. 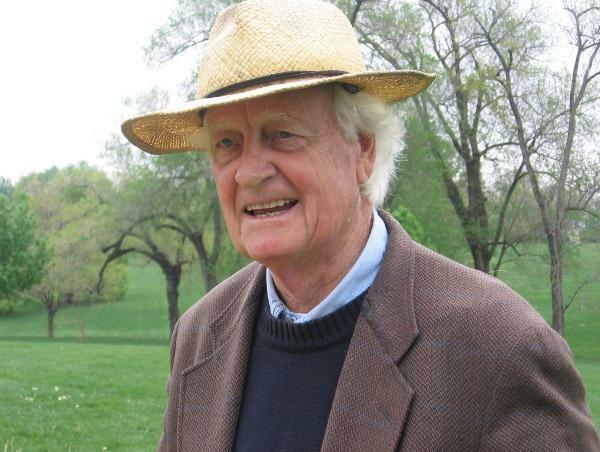 Upon arrival at Swope Park, Robert Bingaman takes roll before reading a poem by Walt Whitman setting the tone for the Kansas City Plein Air Coterie. Bundled up against an icy wind, Molly Bingaman prepares for a morning of painting. Bingaman (from left) and Melissa Lenos raise the KC PAC flag as the other artists head out to find a suitable landscape. A winter sun lights a snowy scene. Tristan Telander takes in the frozen vista. Huddling out of the wind, Telander takes shelter beneath a monument as she sketches. Molly Bingaman observes from her sketch table. Striped gloves protect Bingaman's hands as she works. Using a tripod to secure his artwork, Christopher Bell paints. Frost coats Bell's beard as he works in a snowy field. Bell uses oil to paint on cold days to prevent his medium from freezing. Bingaman's paint lies scattered on the frozen ground as he works. Bingaman peers over his easel. Every Sunday for the last two years or so, a group of artists has been heading outside to capture the charm of Kansas City on their canvases. You might even see them, brush in hand, in the West Bottoms or at Longview Lake. 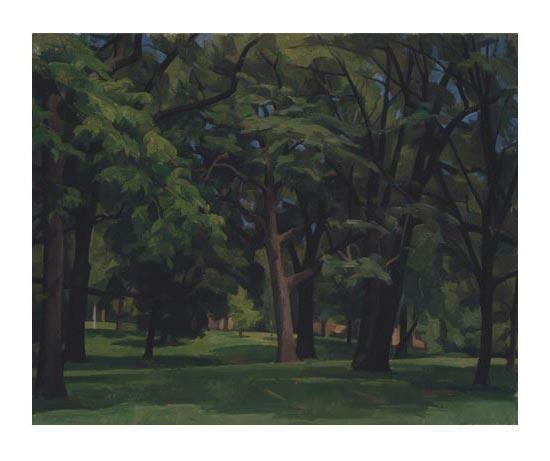 Landscape painting is nothing new, but this group – known as Kansas City Plein Air Coterie or KC PAC — has a unique style and curious rituals that set them apart from other outdoor painters. It’s cold and early. To be specific, it is 8:30 a.m. and 14 degrees. But nevertheless, five members of Kansas City Plein Air Coterie, known as KC PAC, line up dutifully in snowy Swope Park for roll call. They will spend the next hour plein air painting, completing a landscape of Swope Park. The group is celebrating its 101st consecutive Sunday morning session and, coincidentally, the inauguration of its 101st member. KC PAC has four founders: Robert Bingaman, Kelly John Clark, Nicole Mauser, and Lee Piechocki. It started innocently enough two years ago as the friends, all artists, sat in a bar lamenting that their studio practices were stale. Then suddenly, it hit them: plein air painting. "It’s out of that kind of stir crazy absurdity where you don’t know the full rationale behind your thoughts, but we looked at each other and were like 'Let’s go plein air paint, let’s go outside! Let’s go tomorrow! ;'" says Bingaman. He admits the first week was a disaster: “It was awful; it was a ridiculous experience. I was completely unprepared." It was awful, he says, because the founders had spent very little, if any, time plein air painting. Plein air is a French term meaning "in the open air"and is used primarily to describe the culture of painting outdoors in natural light. The style came into vogue during the mid-19th century when French Impressionist painters such as Claude Monet and Pierre-August Renoir did much of their work outdoors or en plein air. However, the founders gave very little thought to Monet or Renoir, instead taking inspiration from Kansas City plain air painter, Wilbur Niewald. "When we were not sure how serious we were about all of this but we were coming up with ranks and rules anyway, the rank that always sat above founder was 'Father Niewald.' So we considered ourselves to be incorporating him in some sort of loosely spiritual way," Bingaman explains. Over the past two years, the group has become a unique community, due in part to the curious rules and rituals that shape KC PAC sessions. Although membership is by invitation only, once inaugurated, there is a very clear trajectory one must take in order to become a senior member. The group also assigns special ranks, such as Journeymen or Scout, to members with unique expertise. The incongruence of this is not lost on the founders – the contradiction of placing rigid boundaries around an activity that is, at its heart, one of mental repose. Founder Kelly John Clark says that initially, the rules were a way for the group to sustain interest in the activity as well as weed out insincere participants. But now that all members are hooked on the activity and sincere in its pursuit, the rules ensure consistency. Member Melissa Lenos says she thinks the rules represent something different to each member, but over time the structure of KC PAC is the thing to which people become most attached. Another reason structure is necessary is that KC PAC paints for just one or two hours each week, completing an entire painting in that time. Clark explains that the idea is not just to have fun but to actually complete work. He says the time limit doesn’t make him feel rushed. In fact, he finds it satisfying. "Sundays are this really lovely chance to make something in one hour or more likely two hours," says Clark. "And have it be started and finished within those two hours." Despite working against the clock, most members think of these Sunday mornings as an opportunity to slow down. Member Tristan Telander says setting aside time to consciously slow down is important because it is increasingly rare in the contemporary world. "We look at the first two sentences of articles and we flip through people’s pictures and just get the gist of them," says Telander. "KC PAC provides a regular basis to do a mediation on looking." Bingaman feels the same way; he thinks people go through life with heads down and eyes averted to numb themselves against so much visual stimulus. Plein air painting has given Bingaman new eyes not just for his artwork, but also for his city. “I drive around the city and I see all the places we painted, I think ‘Oh, there’s that tree or that wall that I spent time with,’ and it just makes me love this city so much more," he says. Bingaman’s hopeful that the actions of KC PAC might ignite a spark for other Kansas Citians as well. “I really love the idea that someone who’s from Kansas City, who maybe has some of that sense that it’s not a destination like other places, can stop and realize that this, what I’m looking at, what’s in front of me – has been deemed worthy by an artist to paint," says Bingaman. 'Sunday Painter,' works by Kansas City Plein Air Coterie (KC PAC), at the Greenlease Gallery on the campus of Rockhurst University, Kansas City, Mo., through March 15, 2014. 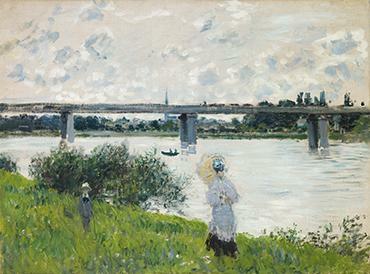 A new exhibition, Impressionist France: Visions of Nation from Le Gray to Monet, at the Nelson-Atkins Museum of Art examines the relationship between landscape and national identity. There are more than 100 paintings and photographs, from 1850 to 1880, including works by artists such as Manet, Monet and Le Gray, as well as artists well-known at the time but not today. Photographers and painters construct "an idea of nation"
The work of iconic Mexican artists Frida Kahlo and Diego Rivera is on display this summer at the Nelson-Atkins Museum of Art. They’re part of an exhibit called Frida Kahlo, Diego Rivera and Masterpieces of Modern Mexico. Kahlo and Rivera are known not only for their paintings, but for their tempestuous marriage, which sometimes influenced their art. Artist Wilbur Niewald, professor emeritus of painting at the Kansas City Art Institute, draws and paints from direct observation – what he sees around him. In this interview, Kemper Museum Educator of School and Family Programs, Lauren Park, talks to exhibition artist Wilbur Niewald about the term “plein air” painting.